There are many reasons people have headaches – it could be due to stress, hormonal imbalances, an allergic reaction, heredity, diet, a nervous irritation or a muscular imbalance etc. For our discussion, we will be focusing on 2 main reasons people have headaches with respect to the neck – irritation of nerves or irritation of muscle (or other soft tissue). Irritation of nerves typically starts at the spine. In order to understand irritation of nerves that start at the spine, we must review some anatomy. The neck bone structure consists of 7 cervical vertebrae stacked on top of each other. The cervical vertebrae all have a cartilaginous disc in between each of them that allow the spine to flex and twist. 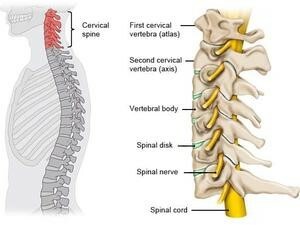 Also in between each vertebrae is a place where nerve roots exit on either side of each vertebrae. It is the irritation of these nerve roots (particularly those exiting from the top two vertebra) which causes a vast majority of headaches. These nerve roots can become pinched by misaligned vertebrae or when discs bulge out or even herniate (the disc material leaks out under pressure) putting pressure on the nerve roots leading to headaches. 4. 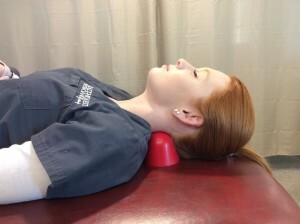 Rotators – Muscles that rotate the neck can be located in any structural location of the neck – the front, back or sides of neck contain muscles that rotate the neck. To envision the action of neck rotation, it is simply the action of turning your head to either side (like when you turn to look when you are backing your car out). 1. Subluxation – Subluxation is defined in chiropractic as any joint that becomes slightly misaligned or stops moving correctly. 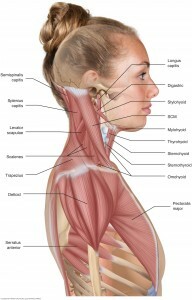 The most common type of subluxation in the neck involve facet joints. The facet joints are the most posterior joints connecting each of the seven cervical vertebrae. 2. Disc problems – The discs located in between each of the vertebrae can bulge or herniate. Located in the center of each disc is a gelatinous material. Over time the walls of the disc can weaken and break down allowing this gelatinous material to push out or bulge toward the outside of the disc. If the wall breaks and the material actually leaks out, this is called a herniated disc. The problem with a bulge or a herniated disc comes when the displaced disc places pressure posteriorly toward the nerve roots that are exiting on either side of the spine at any of the various levels of the vertebrae. This can cause not only headaches but also neck pain and also pain down into the arms and hands as well. 3. Muscle weakness or injury – Problems with the muscles of the neck can also be a cause of headaches. These muscles can weaken over time or spasm due to strain causing neck pain. 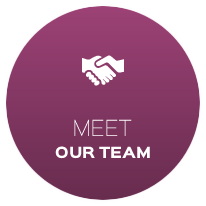 Being a multi-specialty clinic, there are many ways that we can treat headaches in our clinic. 1. Chiropractic adjustments – chiropractic is the science, art and philosophy of treating subluxation. When a joint is subluxated it can cause not only headaches but could lead to numbness, tingling, burning and loss of function – among other symptoms. Chiropractors are trained to gently adjust the neck in order to restore alignment and function to the joints of the neck and thus decreasing and eliminating headaches. c) Strengthening – specific exercises can be given to strengthen weak muscles, thus restoring muscular balance to the neck. d) Axial decompression – This is a specialized form of treatment typically for the treatment of disc bulges or herniation. The patient is placed on a special computerized table that gently and slowly distracts the spine over a 30 minute session. The action of the distraction creates a negative pressure or “vacuum” effect that draws the disc material back inside, thus getting pressure off of the nerves that is causing neck pain or headaches. 3. Acupuncture – Acupuncture is an ancient healing art started in China over 4000 years ago. The premise of acupuncture is based on meridians (or pathways of energy) that run throughout the body. When a practitioner of acupuncture places needles into the body, they are placing those needles on key points along those meridians in order to manipulate that energy in order to promote healing in the body. Acupuncture is very effective at treating headaches and restoring overall function to the body. 5. 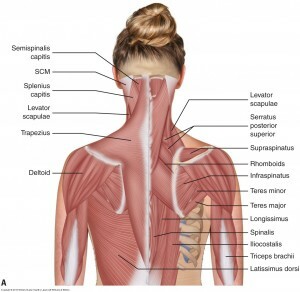 Massage – Often headaches are the result of tight muscles. Or sometimes the tight muscles might result from having headaches. Either way, headaches can be relieved with massage by relaxing muscles, increasing blood flow to help speed healing and flushing out toxins in the soft tissue. You can perform the following exercises and tips at home or at work to alleviate your headaches, and to help strengthen, stabilize and improve any muscle imbalances, which are most commonly resulting from poor posture and causing tension in the muscles on the back of your neck. The first of these exercises is called a head-neck retraction. The goal of this exercise is to help take some of the tension away from the muscles on the back of your neck and to help strengthen the muscles on the front of your neck. 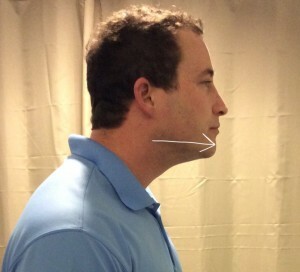 Start this exercise off by jutting your chin forward. 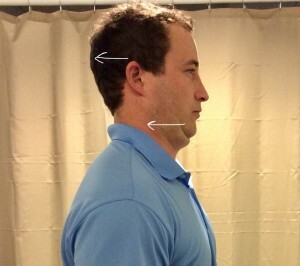 You will retract or bring your chin straight back and hold for 2-3 seconds, without bending the neck backwards. If this is done correctly, you should feel at stretch at the top half of your neck. The next exercise you can perform at home is also designed to help decrease some of the spasm and tension in the back of your neck. There are a couple options, you can use for this, but both are going to achieve the same result. First option, involves using a still point inducer. The second option is essentially a homemade version of a still point inducer. For this you will take two tennis balls and place them in a tube sock. 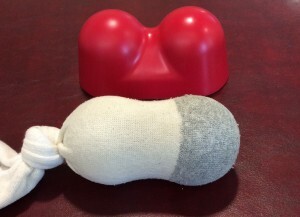 Then take the tube sock, pull it as tight as you can so the tennis balls contact each other, and then tie a knot in the sock. Now, take either the still point inducer or tennis balls, and place them under the base of you skull as you lay down on top of them. You can lay on these for anywhere from 10-15 minutes daily, until you feel the tension in those muscles release. This should not be painful, and if it is stop performing the exercise. The next tip you can do at home for headache relief involves using acupressure points, which are located in the meaty web portion of your hand between the thumb and pointer finger. 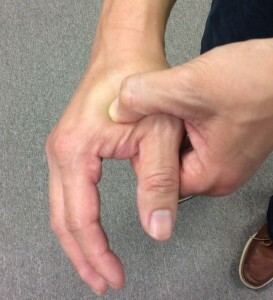 To find the proper spot or point, you want to take two fingers from the opposite hand (usually the thumb and pointer or middle finger) and feel around in that area between the thumb and pointer finger until you find a tender spot or a “ball” of muscle. You will then squeeze that area and massage it with a circular motion until the tenderness fades away. You can perform this as often as you like, and make sure to check that area on both hands for any tenderness.